1 That night the king had trouble sleeping, so he ordered an attendant to bring the book of the history of his reign so it could be read to him. 2 In those records he discovered an account of how Mordecai had exposed the plot of Bigthana and Teresh, two of the eunuchs who guarded the door to the king’s private quarters. They had plotted to assassinate King Xerxes. 3 “What reward or recognition did we ever give Mordecai for this?” the king asked. His attendants replied, “Nothing has been done for him.” 4 “Who is that in the outer court?” the king inquired. As it happened, Haman had just arrived in the outer court of the palace to ask the king to impale Mordecai on the pole he had prepared. 5 So the attendants replied to the king, “Haman is out in the court.” “Bring him in,” the king ordered. 6 So Haman came in, and the king said, “What should I do to honor a man who truly pleases me?” Haman thought to himself, “Whom would the king wish to honor more than me?” 7 So he replied, “If the king wishes to honor someone, 8 he should bring out one of the king’s own royal robes, as well as a horse that the king himself has ridden—one with a royal emblem on its head. 9 Let the robes and the horse be handed over to one of the king’s most noble officials. 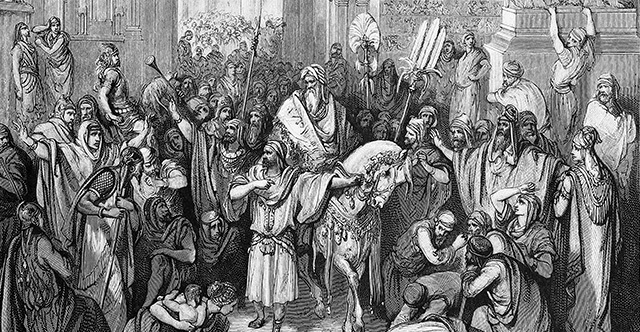 And let him see that the man whom the king wishes to honor is dressed in the king’s robes and led through the city square on the king’s horse. Have the official shout as they go, ‘This is what the king does for someone he wishes to honor!’” 10 “Excellent!” the king said to Haman. “Quick! Take the robes and my horse, and do just as you have said for Mordecai the Jew, who sits at the gate of the palace. Leave out nothing you have suggested!” 11 So Haman took the robes and put them on Mordecai, placed him on the king’s own horse, and led him through the city square, shouting, “This is what the king does for someone he wishes to honor!” 12 Afterward Mordecai returned to the palace gate, but Haman hurried home dejected and completely humiliated. 13 When Haman told his wife, Zeresh, and all his friends what had happened, his wise advisers and his wife said, “Since Mordecai—this man who has humiliated you—is of Jewish birth, you will never succeed in your plans against him. It will be fatal to continue opposing him.” 14 While they were still talking, the king’s eunuchs arrived and quickly took Haman to the banquet Esther had prepared.